Home > Questionnaires > Questionnaire: Am I Eligible for Housing Benefit? If you’re on a low income and unable to afford your rental payments, housing benefit may be able to offer you a helping hand. Claiming housing benefit could be the make or break factor in whether you can or can’t afford to rent a property. These few questions should give you an idea as to whether you are eligible for housing benefit. 2, How Much Do You Earn/have in savings? 3, Is the Home you Want to Rent Owned by a Close Relative? 5, Do you Have Children? 6, Are you an Asylum Seeker or Sponsored to live in UK? You can claim housing benefit whether you are in full-time work or unemployed. If your annual wage and savings amount to less than £16,000 you will be able to apply for housing benefit because you will be classed as being on a low income. If you have any special circumstances you will be viewed as a priority case and it will work in your favour. But if you live with a partner or civil partner, even if both of you are eligible for the benefit only one of you will be able to claim if you are living in the same property. Restrictions will also apply if you are under 25-years old. Those under 25-years old and single will only be able to claim the benefit for bed-sit accommodation or a single room in shared accommodation. The criteria for qualifying for housing benefit can differ greatly between each local authority, so even if you are unsure as to whether you qualify it is still worth applying. The pivotal aspect of whether you can claim the benefit is whether your savings and wages combined top £16,000. If they are only slightly over you may want to think about whether it benefits you to cut down on some of your working hours and use some of your savings so you are under the £16,000 threshold. If the property belongs to a relative you may have to be assessed as to whether this is a close relative. If your local council does view them as a close relative you will be unable to claim the benefit. If you are disabled or have a child this may work in your favour, but what your council will be looking for is whether you can support yourself and your child without the help of housing benefit. Unfortunately if you are from overseas and are sponsored to live in the UK you will not be able to claim housing benefit and may need to wait until you receive your full residency. unfortunately it sounds like you are unlikely to be able to claim the benefit. If you have savings and wages combined of over £16,000 you will automatically not qualify. If you are a full-time student you will also not be able to claim housing benefit, though there might be other types of benefit that are available to you. If the house belongs to an immediate family member such as a parent or sibling, it is unlikely you will get the benefit because the money will be going direct to a family member and the council may see this as a conflict of interest. 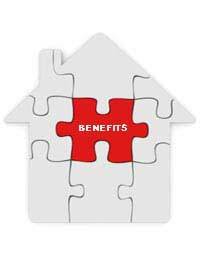 Even if you are not sure whether you qualify for housing benefit you should still apply to your local authority. They may be able to help you find an alternative solution to your financial troubles or find other forms of benefits that are open to you go help you afford your rent.